At Premier Eye Center we offer a wide selection of contact lenses including disposable soft contact, bifocal/multifocal, toric, and colored lenses. Whether you wear daily, weekly or monthly disposables, or conventional (vial) lenses, check out our selection of lenses that fit your needs. 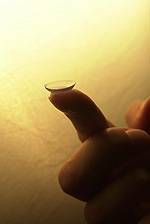 A good contact lens fit starts with a thorough eye exam at Premier Eye Center to ensure the most up-to-date prescription and rule out any pre-existing conditions that could interfere with contact lens wear. 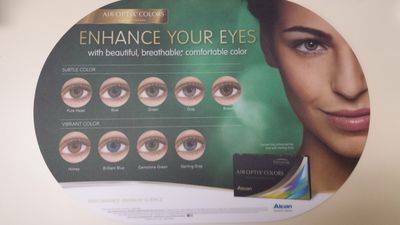 Our offices are now offering the latest lenses from Alcon - Air Optix Colors. Premier Eye Center is now featuring special discounts on Bausch & Lamb Contact Lenses and specifically Biotrue ONEday and Ultra/Ultra-Toric Contact Lenses. Please call your Plantation, Boca Raton or West Palm Beach optometrist to see what discounts apply to you. 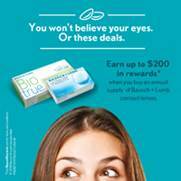 For Biotrue ONEday contact lenses, after the rebate, an annual supply will cost $280 before applying your vision insurance benefits. There is also a great discount on Ultra or Ultra-Toric contact lenses - $140 for an annual supply after a $120 rebate. Please call us or stop by today to discuss these special discounts from Bausch & Lamb. To schedule a contact lens fitting or to get a contact lens prescription, call Premier Eye Center in Boca Raton today at (561) 482-8300. We have two other locations in Plantation and West Palm Beach that offer the same services.